I can't believe it's already the last day in April, so I thought this would be a good time to start a monthly recap tradition. Even though there are lingering WIPs, I know I got some stuff done this month. I thought it would be encouraging to go into May with an overview of the things I actually accomplished in April. I only finished one this month. If I can get my design work and cutting done ahead of time, it would be no problem to turn out one of these a week just working on them in found time. Crafty hero, Clare with selfsewn, has a great tutorial! These guys are winners. 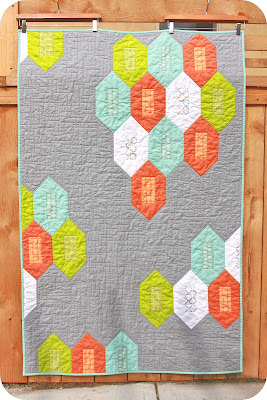 The blocks are so cute, and I love the way they turned out with the fabrics I pulled from my limited stash. The best thing is the new skills I've been picking up while working on them. I'll keep making them to swap with the Austin Modern Quilt Guild, and hopefully I can make enough for myself to craft up some sort of quilt. I reviewed the Zakka Style book and made one of the sample projects. I'm happy with the way the potholder turned out. It's a shame that several projects in the book seem to have errors in the instructions. If you're crafty, though, just wing it. After pulling out stitches a few times, you can get a cute finished product. I worked very intensely on this quilt for two weeks. It was tough, but I love how it turned out. There are definitely some changes I'd make, but it has pattern potential. I picked up a few new skills while working out the kinks, but a couple of changes would make the quilt top come together much faster. Also, quilting densely with my walking foot was very time consuming. If I'd had the right color thread on hand, all-over FMQ would have been a big timesaver. May is upon us! How did your month of April go? I'm linking up with Polly Want a Crafter and Lily's Quilts for the Fresh Sewing Day and Small Blog Meet! If you're a blogger with less than 50 followers, the Small Blog Meet is a great way to connect with people in the sewing blogosphere! I can't wait for a pattern for your baby quilt. It's adorable and like nothing else out there. That are some lovely projects you did ... and congratulations on being a "big" blog now! Looks like you made some great things in April. i'm stopping by from Lilly's small blog meet. I'll follow you to see what you are making in May. So Excited about Sewing Summit! WIP Wednesday: One Quilt Down. Back to Blocks.